Casa Mosaica, unique rental accommodation with exotic garden and pool in the centre of idyllic Gaucin. Casa Mosaica Is a very unusual and stunning, Moorish-style property in the vibrant and romantic hill top village of Gaucin, one of the celebrated ‘Pueblos Blancos’ of Andalucia; a pretty, traditional village, with spectacular views to Africa, where donkeys are still working and local festivities are enthusiastically celebrated. Hidden behind an anonymous façade is the private, and surprisingly large Casa Mosaica. Unseen from the busy street, the peaceful scented garden is full of exotic palms, jasmines, bougainvillea, mosaics and fountains; the pretty swimming pool in its own courtyard is just what you long for after the heat and bustle of village life a trip to the coast or nearby Ronda. Situated on the Ronda side of the village and easy to find, with parking outside the door, Casa Mosaica is perfectly placed for guests to walk to the shops as well as the many restaurants and charming tapas bars in the narrow lanes of Gaucin without having to worry about driving or parking. Casa Mosaica consists of the self-contained two bedroom, three bathroom 'Casa Mosaica Apartment' on the ground floor, which is self-catering and sleeps up to 4 adults and a baby, and the owner's flat on the first floor. 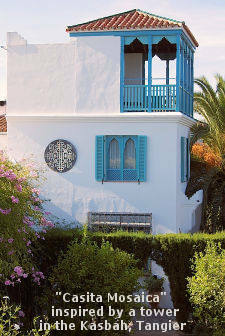 The swimming pool courtyard and the Moorish garden are shared with the romantic hideaway for two 'Casita Mosaica' which is situated in the Moorish garden with its own entrance and private patio garden. The owner will never use the swimming pool at the same time as guests; the pool area is therefore shared with a max of 6 plus possibly a baby with enough sunbeds and umbrellas for all. Alternatively the apartment & casita can be booked together for a large private villa. Casa Mosaica is the home of a London based designer who specialises in mosaics and her 2 friendly house cats, Kevin and Geoffrey. 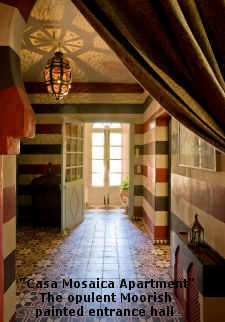 As the house name suggests, Casa and Casita Mosaica are filled with a diverse range of uniquely beautiful hand-made mosaics, these along with the antique furniture, Moroccan rugs, lanterns and attention to every detail give Casa Mosaica its distinctive style and uniqueness as a rental property. It is the owners intention for visitors at Casa Mosaica to feel as comfortable and relaxed as they would in their own home, whilst enjoying the sunshine and excitement of a holiday in Andalucia. "A dream home away from home".